This particular client from Epsom came to The Billington Partnership through the website. The client had looked through many of our finished installation projects and found some examples of potential fireplaces that inspired her. After much consultation, the client finally decided upon a Riva 22″ open convector fire from Stovax with a wide steel frame. The Stovax open convector solid fuel fire provides you with the best of both worlds. 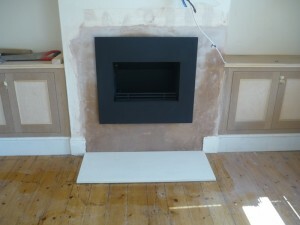 A real open fire yet with a heating efficiency double that of a normal grate or hearth mounted appliance. This is because the Riva open fires have been designed to produce warm convected air as well as radiant heat. 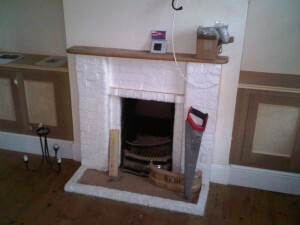 Finally, the images show the huge transformation the new fireplace has made in the house. The client now has a fireplace which will make the house extremely warm in the winter.